Deal for construction of trade route from Sinkiang to Gwadar was signed which will open new horizons of development in Pakistan as well as providing easy access to warm waters for China. This trade route was not only opposed by USA and other regional powers but also became a reason for foreign funded terrorism in Baluchistan, KPK and tribal areas. 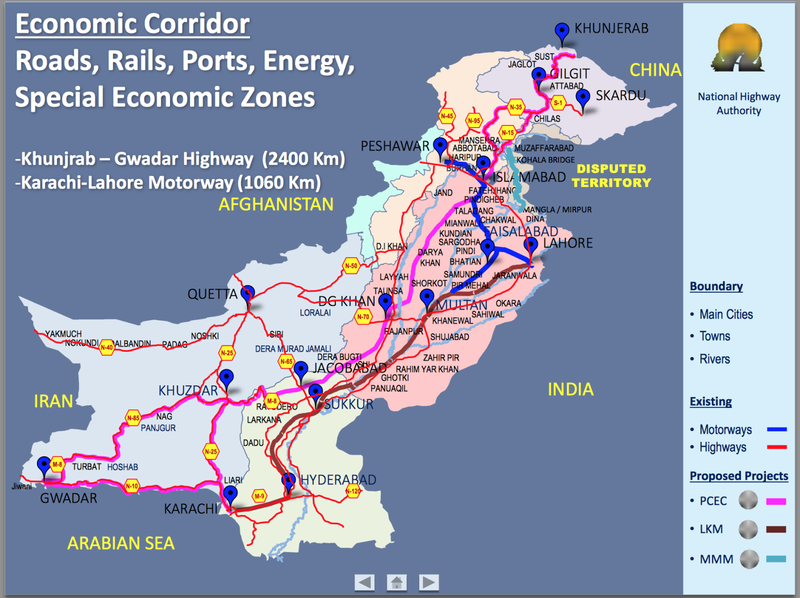 Why did China herself offered to construct Gwadar port and why did General (R) Musharraf accepted offer given by Chinese ambassador in USA in 2002; this is a long story which has been already discussed by me in detail in 2009 along with the map of proposed trade route. This is a bitter reality that with the start of construction work over Coastal highway and Gwadar port by Chinese companies, local newspapers were filled with opposing news reports and within no time they were covered by private TV Channels as well. Baloch sub-nationalists termed this project as an attempt to suppress Baloch rights and announced to oppose it at all levels. In 2003, assassinations of Chinese engineers working over Coastal highway and other projects were started. Chinese workers were kidnapped and murdered afterwards. When law enforcement agencies started to address the issue; a specific media group portrayed terrorists involved in attacks over Chinese as freedom fighters and tried to mutilate the situation by comparing the situation in East Pakistan before 1971. The construction of Gwadar port was to completed in 2005, but Chinese wanted to complete the project earlier while terrorists of Baloch Liberation Army (BLA) were working hard to stop the project. During this phase-II of road was started by Chinese as well, this road was planned to join Peshawar with under construction tunnel at Kohat. In order to stop phase-II, Abullah Mehsood was launched in Malakand, Dir and Chitral from where this road had to pass in the name of Imposition of Islam and announced Jihad against Pakistan army. In order to camouflage foreign funded terrorists launched under the garb of Islam, Western Media and governments started blaming past policies of military governments regarding Afghanistan and termed militancy in these areas as a reaction of these policies. Not only this, traitors were hired and propaganda campaign against Army was started within the country as well blaming Pakistan army for the problems of Pakistan. India laid a network of Indian consulates (launching pads of terrorists into Pakistan) in Afghanistan along with Pakistani border with the nexus of Northern Alliance. 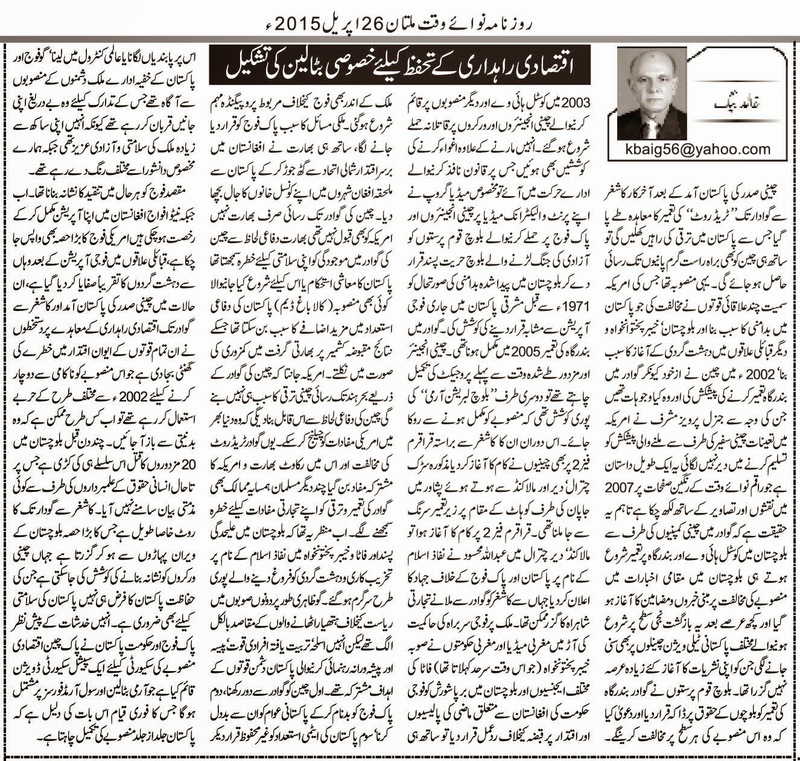 Neither India nor USA was ready to accept the construction of Gwadar port. Access of China to Gwadar was not acceptable to India from defense point of view, moreover India takes every plan of economic development (including Kalabagh Dam) as a strong Pakistan will have increased defense which will adversely affect Indian presence in Indian Held Kashmir. USA is aware that access of China to Gwadar will not only provide economical benefits to China but also enable China to challenge American interests all over the world. In this way a nexus between USA and India was established which was later on joined by few Muslim countries as well who took Gwadar port a threat to their trade interests. Now the situation was that in Balochistan terrorists were active in the garb of separatists while in FATA and KPK the terrorism was being done in the name of Islam. Although apparently the goals of these terrorists in both parts of the country were different but targets of their foreign funders providing them training, weapons, manpower, professional guidance and money were same i.e. 1) to keep away China from Gwadar, 2) defame Pakistan army and 3) portray Pakistani nuclear installations as unsafe in order to take control of it. Although our army and intelligence agencies were aware of the conspiracy and were sacrificing their lives for motherland as they loved their country more than their reputation but a specific group of so called intellectuals were giving it a different color.